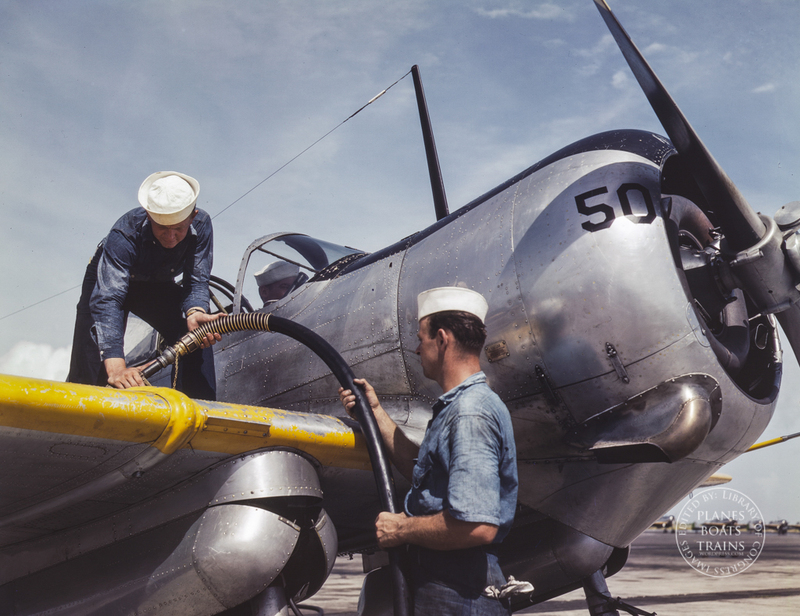 Title: Feeding an SNC advanced training plane its essential supply of gasoline is done by sailor mechanics at the Naval Air Base, Corpus Christi, Texas. Standing on the wing is Floyd Helphrey who came from Iowa to join the Navy early in the year. At right is W. Gardner of Illinois who used to be a crane operator. The Curtiss-Wright CW-22 was a 1940s American general-purpose advanced training monoplane aircraft built by the Curtiss-Wright Corporation. It was operated by the United States Navy as a scout trainer with the designation SNC-1 Falcon. The CW-22 was seen as either a civilian sport or training monoplane or suitable as a combat trainer, reconnaissance and general-purpose aircraft for military use. The prototype CW-A22 Falcon (U.S. civilian registration NC18067) was used as a company demonstrator and is one of four of the type still in existence. An SNC-1 is on display at the U.S. Navy’s National Museum of Naval Aviation, at NAS Pensacola, Florida. The main customer for the aircraft equipped with the Wright R-975 Whirlwind air-cooled radial engine was the Royal Netherlands East Indies Army Air Force and 36 were exported. The aircraft had to be delivered to the Dutch in Australia due to the advancing Japanese forces. A developed version, the CW-22B, was sold to Turkey (50), the Netherlands East Indies (25) and in small numbers in South America. Some of the Dutch aircraft were captured and operated by the Imperial Japanese Army Air Force. The CW-22 and CW-22B were armed with two machine guns, one fixed. An unarmed advanced training version (CW-22N) was demonstrated to the United States Navy. To help to meet the expanding need for training, the Navy ordered 150 aircraft in November 1940. Further orders brought the total to 305 aircraft which were designated SNC-1 Falcon. Curtiss converted a CW-19 into a CW-22 demonstrator. They hoped to use this to sell the CW-22 to China. The aircraft was obtained by the Burma Volunteer Air Force, and later used by the Royal Air Force in India. It was scrapped in 1946.